It's two thirds of a really cool movie. For more than half of its running time, director Adam Schindler's debut feature Intruders cleverly defies expectations, setting up a movie we've seen and quickly taking a hard left to become something different. It's refreshing and it's exciting, particularly within a genre (horror/thriller) that has a tendency to reward a film's ability to conform to certain tropes. Intruders is hardly revolutionary, but it's surprising enough to keep the viewer on his or her toes. That alone carries a certain charge. Once it starts explaining its own mysteries, the air rushes out of the movie. It's an all too common occurrence, as answers are rarely as compelling as questions. To the credit of Intruders, it asks some intriguing questions for a while. The majority of movies don't. I know I say it a lot, but it's better to know nothing about Intruders going in. If you plan to see it, stop reading here. I won't be spoiling anything, but it's the kind of movie that can be better enjoyed the less one knows. Beth Riesgraf (so good as weirdo thief Parker on Leverage) plays Anna, an agoraphobic woman who loses her brother -- her only family, her only friend and all she has in the world -- to cancer. Alone and trapped in her house, Anna gets a visit from a group of thieves looking to rob of a lifetime's worth of money they know she has stashed. There are some surprises from there. I'm not particularly a fan of the home invasion genre, yet I find myself drawn to the movies like this and Adam Wingard's You're Next that invert it and turn it on its head. I don't know if that's because of my own anxieties about being attacked and utterly powerless or because I love movies in which justice is served (even if that justice is blood-soaked revenge). 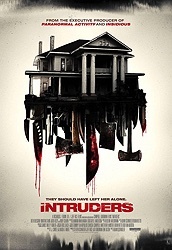 Intruders starts out as a home invasion movie and then turns into something different; I won't say it completely turns the tables on the antagonists (the way You're Next does), but it has some really fun tricks up its sleeve. The best surprise of the movie -- besides the leading lady turn by Riesgraf, who deserves more work -- is the performance by Martin Starr as one of the thieves. Often cast as the geek of either the hopelessly pathetic (Freaks & Geeks) or sarcastically angry (Silicon Valley) variety, here Starr is legitimately scary as the most dangerous of the intruders. The most inspired aspect of Starr's character (and performance) is that he's never just an unhinged psycho. When you really think about what he says and does in the course of the film, he's usually right. He may not be "moral" in his arguments or behavior, but he's right for the reality of the situation. I respect a film that allows its darkest character to also be, for lack of a better term, the voice of reason. It's difficult to talk about my issues with the movie without being specific, which I don't want to be here. The screenplay begins to explain some of the movie's more puzzling and intriguing developments, and those explanations offer not only disappointing context for what has come before but also use some exposition that's of questionable taste. Movies don't have to be tasteful, of course -- particularly horror (or horror adjacent) movies like this one -- but there's something icky about how casually and conveniently Intruders introduces certain elements for the sake of wrapping up a little indie thriller. These ideas might deserve more consideration. While it may not totally stick the landing, I liked most of Intruders enough to warrant a recommendation. It's surprising in a fun way and adds enough twists to a genre I don't otherwise care for that it is, for more than half of its running time, thrilling. That I don't care for the final third doesn't devalue what comes before. Had the whole movie worked as much as its setup and part of its execution, I'd be championing Intruders as the first major pleasant surprise of the year. Instead I'll just have to settle for a decent little thriller that's different enough -- or at least derivative of enough different sources -- for me to dig it. Intruders is currently available on VOD and iTunes. I really liked it too, Patrick. It felt fresh and the performances were pretty good all around. I wasn't that bothered by the finale and thought it was fine in relation to the movie as a whole. I personally do fee that Intruders was the first pleasant surprise of 2016 movies that I have seen so far. Yeah, I'd still call it a pleasant surprise. I just wasn't crazy about the last act so I feel like I can only recommend it with a caveat. Like I said, though, not a dealbreaker. I dug it. Good job on the review, btw. Not an easy movie to write about without spoilers. Even the synopsis on Amazon and IMDB gives too much info. Sorry, impulse post. People should watch this film.